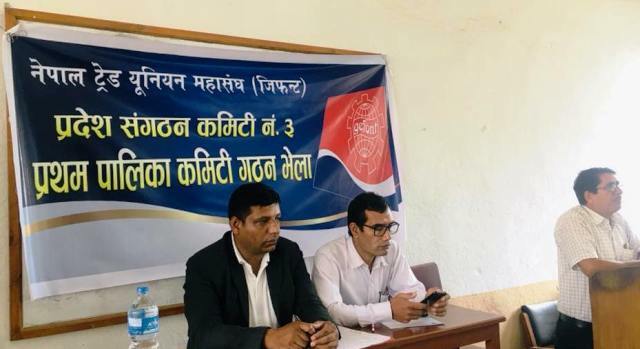 General Federation of Nepalese Trade Union (GEFONT) Province No. 3 Kathmandu Metropolitan Gathering has been concluded in Kathmandu. Addressing the Gathering, Chief Guest GEFONT Vice President Jeetendra Shrestha briefed about GEFONT Policy and Programmes as well as highlighted about the unification process of GEFONT and ANTUF. During the Gathering, GEFONT NEC Member and President of Province No. 3 Ram Hari Nepal brifed about recently increased minimum wage, Labour Act and Rules, Social Security Act 2074. He further highlighted about GEFONT new structure according to the Federal System of Nepal. The Gathering has formed 18 members GEFONT Kathmandu Metropolitan Committee under the Convenorship of Tulsi Dhakal.The Programme conducted by Province Secretary Arjun Aryal and NEC Member & MP of Province 3 Sita Lama welcomed the participants.